Spending time is nature is one of the keys to a healthy lifestyle. This article, written by Lydia Uhlir of the Forest Preserves of Cook Country, originally appeared in the Illinois Pediatrician newsletter. Basic principles of a healthy lifestyle include, eating well, exercising, getting enough sleep, limiting alcohol and abstaining from smoking, AND just as important, but missing from this list is spending time in nature. It could be a leisurely walk or a run along a wooded path or even just relaxing on a bench in a park. Numerous studies have shown that daily exposure to nature has a wide range of health benefits on everyone, no matter the kind of activity, no matter the age or gender. Even minimal time in nature, as little as 30 minutes, can have a variety of health benefits for your body and mind. Being outside in nature has been shown to stabilize hormone levels, lower blood pressure, release muscle tension, and improve the functioning of the body’s immune system. The net result of all these effects is a decrease in overall stress, but the effects of nature go well beyond this. Organizations like the Forest Preserves of Cook County (Forest Preserves), which manages nearly 70,000 acres of public land, understand the positive effects nature has on human health and wellbeing. In order to spread this message and engage people through a health and wellness lens, the Forest Preserves has partnered with the Cook County Department of Public Health (CCDPH) as part of their Healthy Hotspot initiative that aims to establish healthy spaces, called Healthy Hotspots, in suburban Cook County through community partnerships. 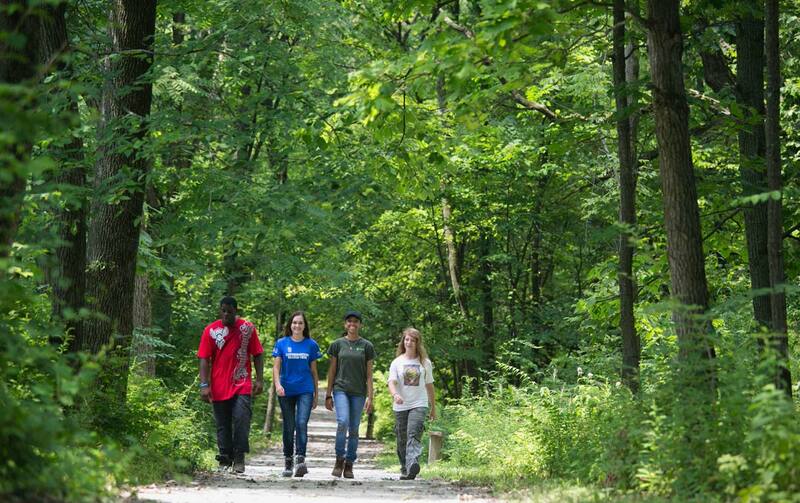 The Forest Preserves are Healthy Hotspots, making healthy living easier for local residents by providing them with opportunities to connect with nature and outdoor activities. The Forest Preserves is promoting all the benefits nature has on human health and wellbeing through both the CCDPH’s Healthy Hotspot initiative and its own Wellness in the Woods initiative, which encourages people to be active, playful and restful in the Forest Preserves through a variety of activities, including biking, running, or hiking over 300 miles of trails, experiencing unstructured playtime at its nature play locations, or learning about local wildlife on a bird walk. A Wellness in the Woods brochure that details activities like the ones listed above is available in English and Spanish and is being distributed to local community health clinics and agencies. Another health and nature-related project involves Dr. Terry Horton from Northwestern University who is conducting a research study to understand the influence of walking on physical and mental health. The study will compare walking in natural areas vs. on a suburban sidewalk. The Forest Preserves along with several other organizations is helping to fund the study. Hopefully the study will provide additional data to improve our understanding of the affects nature has on human health. The Forest Preserves continues to actively seek partnerships with the healthcare community and encourages interested health organizations, clinics, hospitals and medical practices to reach out to their local forest preserve district, park district, nature center, or conservation based agency to partner on health and nature related projects and initiatives. These types of partnerships and collaborations are an essential component in reaching communities and spreading the important message of spending time in nature. For information about the CCDPH’s Health Hotspot initiative, visit Healthy Hotspot. For information about the Forest Preserves’ Wellness initiative, visit Wellness in the Woods. If you are interested in obtaining Wellness in the Woods brochures, please contact experience.nature@cookcountyil.gov and/or if you are interested in partnering with the Forest Preserves on a nature and health related project please contact Cathy Geraghty. Bishop B. Nature for Mental Health and Social Inclusion. Disability Study Quarterly.2013;33. http://dsq-sds.org/article/view/3430/3205. There is definitely a great deal to learn about this topic. I love all the points you’ve made.